This weekend I had the opportunity to co-present in a couple of sessions at the Texas Council for the Social Studies (TCSS) annual conference in Fort Worth, Texas. I was in two different sessions, one on Friday and one on Saturday. Details and resources from each session are below. This session was organized by Dan Krutka at Texas Woman's University, and also included Michelle Bauml from TCU and Katie Payne from UT Austin. We discussed resources and organizations in which social studies teachers can use to get ideas for their teaching. We shared some resources, then we opened up the discussion for others in attendance to share the resources they use for their teaching. The latter part of the session was excellent, and I could barely keep up as I scrambled to take notes. You can view our slides and group document below. The document is open for anyone to contribute, so please feel free to add resources you find helpful (if in fact you teach social studies). Michelle Bauml and I also presented a session on using images in social studies instruction. We knew there would be a wide variety of participants with differing levels of technology skills, so we wanted to present activities that range from no technology needed to those that require somewhat advanced technology skills. This session included several hands on activities and many examples. You can view the slides and session resources below. I recently contributed to a panel for the K12 Online Conference 2015 about the changing role of technology in teacher preparation. The project was led by Wes Fryer, and other panelists included Cyndi Danner-Kuhn and Dean Mantz. 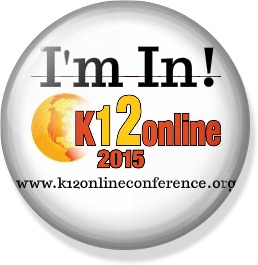 The K12 Online Conference is completely free, completely online, and completely full of excellent presentations about innovative practices in classrooms across the country. This is my second time to be involved in a presentation, and it is a great experience. Besides the convenience of being able to learn and collaborate without the burden of travel, this conference has an amazing reach. As of this morning, our panel discussion had 22 views on YouTube, and it was only posted today! I usually do not get 22 people in any of my conference presentations, so it is remarkable to think more and more people will get to engage with our ideas over time. You can see our presentation description on the K2 Online Conference website, and I have also embedded the panel discussion below. These days I am thinking a lot about digital portfolios. I have been looking at a lot of them, talking a lot about them and coincidentally, evaluating a lot of them. So that I don't forget all of this by next Fall, I want to put my thoughts down and try to galvanize some of the lessons I have learned this semester. I presented this project at the very beginning of the semester. I think this was overwhelming to some of the students, but my objective was to make sure they knew about their portfolio all semester. I knew some (or many) of them would put this off until the last minute, but I also knew some of the students would appreciate getting an early start. So, I discussed with them the purpose of a portfolio, and we also talked about digital footprints and job searches and other big ideas. Then I showed them some examples of different portfolios from former students using a variety of different tools. The last thing I had them do was open an account with the tool they wanted to use, then send me the URL of their portfolio. Google Sites This is an easy tool to use. The interface is simple, and it is easy to find the features you are looking for. There aren't any hidden features or misplaced menus, just a simple set of tools, layouts and themes to choose from. I have used this tool for several years as a way to organize my lectures, and it works great for this. File uploading is especially easy because it is done directly on the page rather than in a dashboard. You can choose to hide the attachments on each page, then create a link to them. Sites builds the menu as you create pages, so the navigation is almost a no-brainer. You can also easily embed videos, slideshows, images and docs from Google's other services. If you a Google apologist, like me, you will find this very easy and convenient to use. There aren't really that many options when it comes to the look and feel of your Google Site. There are some nice themes, but there is nothing that really stands out or looks flashy (if that is what you are going for). As one of my students put it, "I want my portfolio to look cute." Not exactly my objective when making a portfolio, but that's important to some people. You are able to customize the appearance of the Google Sites, but it takes some time and a little HTML know-how. This is not something a lot of preservice teachers want to dive into. WikiSpaces Like Google Sites, this tool is incredibly easy to use. The interface is very similar to Google Sites, and there are a lot of widgets that allow you to add different media to each page. The file manager is quite different than Google Sites, but it is very easy to use. Each page also has a discussion section, so you can center conversations around each page, as well as see the history for the page. This is quite different than Google Sites, where most of this information is hidden. The History tool is nice if I need to see when a page was last edited (as in, after the deadline). I don't make a big deal about this unless it is a major edit. Aside from being a pretty good portfolio tool, WikiSpaces is a great environment for teaching wikis and collaborative knowledge building. To demonstrate the power of collaborative knowledge building, I had my class collectively make this wiki in about 15 minutes. Like Google Sites, this options for layout and themes are pretty spartan. Some people like this, including me, so it really isn't a con. But the cuteness factor is pretty low. You can customize the website to some degree, but you will have to live with some of the layout features. You will also need to change some of the settings as soon as you create your wiki. The default setting is for anyone to be able to edit the site. If you are using this tool to create a portfolio, you will want to turn that feature off and make yourself the only editor. Webs This tool is where you start to trade ease of use for look and feel. The first two tools look very much like something you would expect from a wiki. Webs looks more like a professional website. You have a lot of options in terms of themes and layouts, and they all look very nice. If you choose to use this tool, be prepared to spend some time messing around with it. I have done a lot of blogging, web design, web mastering, etc., so I was able to make sense of Webs pretty easily. My students, however, struggled with this tool. Once they spent some time with it, the interface started to make sense. I would not recommend this tool to novice web creators. Unless you upgrade to the paid service, you also have to put up with ads on your website. Personally, I wouldn't want ads for reducing belly fat (pictures included!) on my educational portfolio. Wix Of all the tools, this one looks the best. Wix is built on Flash, so it looks very professional and, well, flashy. You are able to upload about any kind of file, and Wix has built in widgets to play and display media. The majority of my students were drawn to this tool because they look so good. Intimidated by new tools? Not familiar with web design? Don't choose this tool. It is NOT for beginners. I had many students choose Wix, and I was able to walk most of them through it. Some of them bailed out and went for Google Sites or WikiSpaces. You will spend a lot of time formatting and figuring out the layout. The end result is a fantastic-looking portfolio, but you will put a lot of sweat equity into it. The most frustrating feature in this tool, which is true of Webs as well, is embedding a YouTube video. By far, the clunkiest I have EVER seen. This is disappointing considering how well some of the other features work. I guess the developers ran out of steam. Weebly This tool is surprisingly easy to use. I am least familiar with it because I didn't have any students choose it. This is how I usually master a web tool, by answering all of their questions. The interface is drag and drop, and even though some of the features (e.g., file uploading) aren't very intuitive, the overall ease of use is a plus. The free service does not include most of the cool features Weebly has to offer. They tease you with a host of widgets and options, but when you try to add them to your page you get a pop-up telling you they are only available for Premium customers. This might not be a bad idea for someone who wants to keep this portfolio around after the class (or graduation) is over, but I am realistic enough to admit that most of my students drop this project like a hot rock once they have a grade. So, there is a simple breakdown of tools you can use for a digital portfolio. This is not exhaustive, nor is it very detailed. But there is enough information to get someone started. I will still recommend Google Sites and WikiSpaces to my students, and I am pretty sure they will still choose Webs and Wix. They're like moths to a porch light. The good thing is, the more of them that choose Wix and Webs, the better I will learn them and the better my support will be. What tools do you use for digital portfolios? Am I missing anything obvious? Let me know! I am in the process of wrapping up yet another semester of teaching preservice teachers how to use technology in their classrooms. It is at this point in the semester, when all of the projects except the final portfolio have been graded, that I start thinking about what went well and what didn't go so well. As someone who is very self-critical, I look at each project and think about ways to improve it for the next semester. This semester, I have been thinking more about how the whole class is structured rather than how to improve each of the projects. I actually think that most of the projects and class activities went well this semester, but the course in general was just a collection of disjointed assignments. I have also been struck by some of the things the students have written in their assignments this semester. I'm not surprised or shocked because I was an undergraduate once and it takes time to get your head around the complex world of learning, students, schools and education. I don't think anyone ever totally gets their head around it. (Sorry, Arne.) But, for some reason I was able to see past the grading of these assignments and start to see some themes emerge. These "themes" emerged as misconceptions about how students learn, classrooms interact and schools operate. There were a lot of assumptions without a lot of support for their claims. So, for once I am going to keep the projects and class activities, but I am going to rework the framework within which I present them. Rather than framing the course around technology tools, I want to frame the course around educational concepts that directly address preservice teachers' misconceptions about learning, teaching and technology. A similar approach has been tried before quite successfully by one of my colleagues, and I am ready to get out of the box a little bit. I have started a draft of my (mis)conceptual framework for teaching preservice teachers about how to use technology as part of their teaching. The general idea is that I will talk about a major educational concept (e.g., scaffolding), introduce a major misconception associated with that concept and address that misconception through a technology-based project. This may end up being the worst idea ever, but it may also work like a champ. I have redesigned this course about half a dozen times or so, and I am not afraid to try something totally new. I'm sure I will be writing something around next December reflecting on how this new approach is working. Do you have thoughts or experience with this approach? I would love to hear your ideas. As I mentioned in my last post, there are a lot of aspects of digital fabrication that I really like. Students being able to design, create, evaluate, re-design and re-create objects that they conceptualized on the computer. Students being able to physically hold something they designed in a virtual environment. There are many elements of this kind of teaching that represent many of the hopes people have had for infusing technology into teaching and learning: direct application, real-world importance, creativity, etc. Until recently, most of my experience designing and fabricating objects had been done in my office on my one machine that is connected to my computer. There was no waiting for other people, no transferring files from one computer to another, no having to think about how and where to save files so I could resume my work at a later time. In the back of my mind I knew that the experience I had fabricating objects would be much different than the whole-class experience my students would have, and there were several technical aspects of this process I had not anticipated until I released it into the wild with my students. I wanted to give the class 1-2 authentic tasks to do. I did not just want to just have the students using the software for the sake of using the software. That has never turned out favorably for me. I wanted them to be able to finish in one week. That means one class meeting for one section and two for another. I wanted them to have fun and like what they are doing. This all gets back to my belief (and that of many other people) that one way to change attitudes toward technology is to provide people with engaging, meaningful and yes, fun activities that include technology. People, teachers in particular, tend to abandon technology because they have had bad experiences with it. So, I set out to design an activity that met these criteria. I had the students complete these activities and submit their work when they were done. The first activity was used to introduce the software (no printing or cutting involved), and the second activity was for application. Overall, my students were very gracious and rolled with the punches. They seemed to like the second activity more than the first (Really!?! ), and though I have no data to support my claims, I truly believe they understand digital fabrication more than they did after reading an article and watching a video. Here are my reflections (both technical, pedagogical and philosophical) from the experience. You have to print from the same computer you will use to cut the shape. If you print from a computer that does not have a Silhouette connected to it, the software will put the wrong orienting marks on the paper and it will be useless for cutting ... unless you want to cut it by hand. The trial version of the software does not let you save your work. You must have a licensed version to save a project on one computer and open it on another. The printing and cutting step of this process is a bottleneck. I have 24 students in each class. They worked in groups of 3, and I brought 2 fabricators to the lab. Under ideal conditions, everything went pretty smoothly. As soon as there was a hitch, and there were a couple, the line got a little backed up. The more fabricators you have, the better. However, the trade-off is that the more fabricators you have, the noisier your classroom will be. I received a couple different versions of this comment, "I have a hard time envisioning myself doing this activity with my class." It's hard to situate an activity within an instructional context AND create obvious connections to other instructional contexts. When you give preservice teachers a task, they tend to focus on the task. A seasoned teacher may do a better job of seeing those connections because she will have more applied experience than a novice teacher. In other words, I could have done a better job of facilitating what Salomon and Perkins call high-road transfer. I think requires some application and reflection, which we didn't really do. Related to the previous observation, there needs to be more emphasis on creativity in teacher education programs. Rather than being a thing a person either has or doesn't have, I think of creativity more like a muscle that needs to be exercised in order to grow and stay healthy. The older I have gotten, the more purposeful I have become in my creative pursuits. As for my role in the creative development of my students, I think the best way to do this is for them to create a digital fabrication activity in their preferred content area. It's one thing to be able to do my activity. It's an entirely different level of creativity to be able to create a learning activity for a group of children. I may do this at some point. Overall, I would say this was a good activity for my first attempt at a new concept and new technology. I have a completely different vision for how this will look the next time I do it, which is evidence of learning on my part. The first time I thought about managing my identity as a teacher was during my junior year in my teacher education program. The final project for my language arts methods class was a professional portfolio that included: a narrative about myself and my philosophy of teaching, my philosophy of classroom management (which was so ridiculous I am ashamed that I actually put it in print and let others look at it) and examples of exemplary lessons and other projects I created for my teacher ed. classes. I remember putting a lot of time and thought into this project because I knew it could potentially be something really cool/impressive to show during a job interview. At the time, my portfolio was quite the technological wonder. Yes, the deliverable was still a printed document (a book printed and bound at Kinko's), but I designed the entire thing on my Mac LC 520 computer. This was a stark contrast to how my classmates completed the project, which included a mix of word-processed and photocopied pages thrown together in a three-ring binder. I used a scanner and Clarisworks to make the entire portfolio have a consistent design throughout. At the time, it was quite impressive, and I think I still have a copy somewhere in a box in my parent's basement. With all of the digital tools available now (17 years after I crafted my first portfolio! ), there is no reason that preservice teachers shouldn't be able to put together a killer digital portfolio. While many of the principles for presenting a portfolio haven't changed that much, if at all, in 17 years, the tools we have access to for making one are lightyears beyond my little all-in-one Mac. I entered the world of digital portfolios when I was teaching the class "Teaching with Technology" at the University of Virginia. I had my students create a digital portfolio using HTML, and they hosted it on their Home Directory. The project started off very clunky and frustrating and eventually became one that the students all loved and commented that they felt most satisfied with. I eventually abandoned NVU and Home Directory for Google Pages (now Google Sites), and the quality of the projects increased exponentially (not to mention the number of e-mails from frustrated students almost vanished). Looking back, the major drawbacks of this portfolio were that it focused on the projects only from my class and most of the students viewed it as an "assignment" rather than a tool that would continually evolve and could ultimately become an archive of their teaching careers. My journey into the world of digital portfolios continued when I taught at the University of Illinois Springfield. The department I was teaching in (Teacher Education) had adopted TaskStream for the teacher candidates to use for building their digital portfolios, so I had to adopt this tool as well. Overall, it was pretty easy to use and the final product looked very professional. Besides the fact that the portfolio's format was very prescribed (meaning, it helped my department meet its objectives more than it helped the students meet theirs), the main drawback with TaskStream was that it cost money (not a little money, either), almost ensuring that 99% of the teacher candidates would not use it after they graduated. Once again, I was stuck in this rut of "assigning" a digital portfolio for a "grade," which means when the grade is given the assignment is done. So, when I was asked to teach a section of "Computers in the Classroom" at the University of North Texas, I was once again in the position of thinking about how to structure my final portfolio project. Having a little more freedom than I did at UIS and having learned some lessons from UVA, I tried to improve my portfolio project. Here is the project description from last semester (Fall 2010). As you can see, it is still pretty "my-class-centric." But it's amazing what one little blog post can do to spark some new ideas. I taught concurrently with Wes Fryer last semester, and we were constantly bouncing ideas off each other. He addressed digital portfolios in one of his posts, which helped me develop my latest iteration of my digital portfolio project. Here is my latest project description, which I am pretty happy with at this point. I'm sure once my students get their hands on it I will see some areas that need clarification or revision. The obvious weakness of the current version is my rubric (which really isn't a rubric), which I will definitely be revising. So, do you give a final portfolio assignment? How structured/open is it? What elements do you have students include that I have overlooked? So, why do students know so much about certain technologies yet know so little about other types of technology (e.g., educational/learning technology)? The technologies they know and use help them address their priorities, and as sad as it may seem, being a life-long learner is not a priority for them at this stage in their lives. I spend a lot of time talking to teacher candidates about knowing their students and meeting where they are in their skills, abilities and prior knowledge. As a teacher educator, I must do the same with my students. I need to understand their priorities and motivations, and meet them where they are. I was a school teacher for 8 years, and by my own standards (as well as the feedback from parents, students and principals) I did a pretty good job. Sure, there were aspects of my teaching that, when stacked up against the literature I encountered in grad school, would have been labeled less than exemplary. But I think in most respects I was effective, had a good relationship with the students and parents and my students left my class with a lot more knowledge and skills than they came in with. The problem with all of this is that it occurred within my classroom and was only observed by my students and me. And my students weren't really critiquing my teaching. They were active participants in the process and the reason the teaching was taking place. Contrast this with my current teaching assignment. I teach about teaching. So, when I tell the students they should do this or that, I need to model this or that. When I was a teacher, I would try implementing this or that, and sometimes would continue using this and completely abandon that. And it ended there. My teaching strategies were the means to an end ... student learning. Now, the end is parallel to the means. I want my students to learn good teaching techniques, but I also feel this pressure to use good teaching techniques in order to teach them. It would be far easier to plan a lecture, flip through some slides and give a test. But it seems to me that the best way to teach certain pedagogical approaches -- say, cooperative learning -- is to design lessons that implement those pedagogical approaches. Additionally, they can't be done in a "community of practice" sense either, where I make some mistakes and we talk about the teachable moments and learn from the things the professor screwed up on. The lessons need to be delivered with precision and completely thought through. I feel at times like I am stuck in some performance assessment nightmare, where I am being judged not only on my knowledge of the content but also by my delivery of the content. When the preservice teachers have had a chance to participate in the teaching strategy, it seems to me, we have something to talk about. They observed/participated in it, and now we can talk about it in real terms, rather than treating the teaching strategy like some straw man that everyone beats down yet has no real experience with. As my advisor used to say, it's easy to stand on the sidelines and throw rocks, but it's a lot harder to actually do something meaningful and thoughtful. Of course, he was referring to publishing, but it also applies to the art of teaching. This is all fresh on my mind because I just gave a lecture to my students on how to lecture. My talk was well planned out, and I had a lot of good suggestions for the students. But as I reflected on the class, I was struck that I didn't do some of the things I had told my students they should do when lecturing to students. Strategies such as providing students with a note-taking template and using questioning to check for comprehension and engage the listeners. Basically, I didn't feel like I effectively modeled what I was telling my students they should do in their lectures. This brings me back to the title. Good teaching is hard to do. It takes a lot of extra time that the teacher will really never get paid for. That never really mattered to me because the standards I set for myself were always higher than those imposed by other people. Good teaching really is hard to do, but it's even harder to model.